Today I started writing in my new 2010 planner. I’ve been putting all my notes, future dates to remember, and appointments on a page at the end of my old organizer, not willing to acknowledge that 2009 is nearly over, and hoping not to let the last few days of the year slip by. However, it’s reached a point where I can’t ignore it anymore, and I think I should welcome the new year in with a good celebration! I’m spontaneously flying to New York to visit dear dear friends, and am so excited to do this. It’s pretty uncharacteristic of me, booking a ticket only a day and a half in advance, but with some wonderful and powerful convincing on their part, my friends got me to buy the tickets and brave the cold weather in New York so that I can snuggle up with them and celebrate! How did they do this? They sent me roses. Seriously, I arrived home at midnight last night and had roses on my doorstep! What sweeties! I can’t wait to step off the plane tomorrow and see them. Another way to positively bring in the new year, of course (and very typical for me), is to bake! 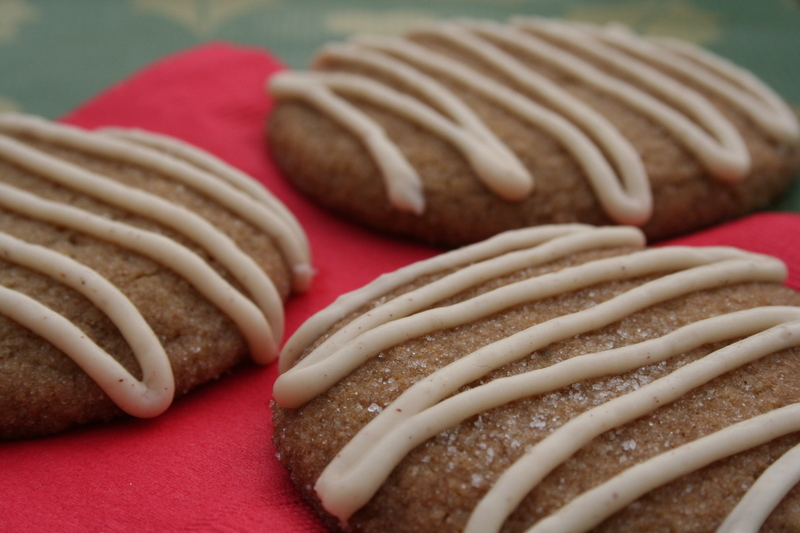 These are the same Ginger Cookies that I made previously, and I told you that we had made them many many times! I just wanted to show you one of the other forms they can take, this time in a sparkly and crunchier form. Well, the middles of the cookies are still chewy, but the coarse sugar coating gives them a super crunchy and sweet outer layer. They are also smaller, nearly bite-sized, so you can justify eating more of them! My mom made these ones, and she used the same recipe as I did before, but she made the balls smaller (about 1/2 – 3/4 inch sized), rolled them in coarse sugar (actually, large clear sugar sprinkles) and stuck a piece of candied ginger on top. Because they are smaller, you can bake them for a minute or two less than described previously (so, only about 8 minutes). These cookies looked really lovely on our holiday platters! I hope that wherever you are, whatever you are doing, that everyone has a joyful New Years. 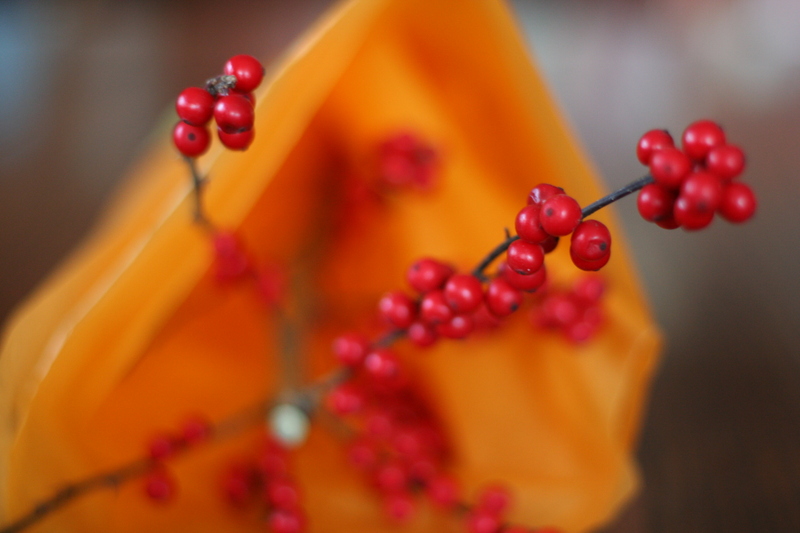 Be safe, happy, and resolve to be thoughtful to yourself and others this year. Above all else, be celebratory, because why not? 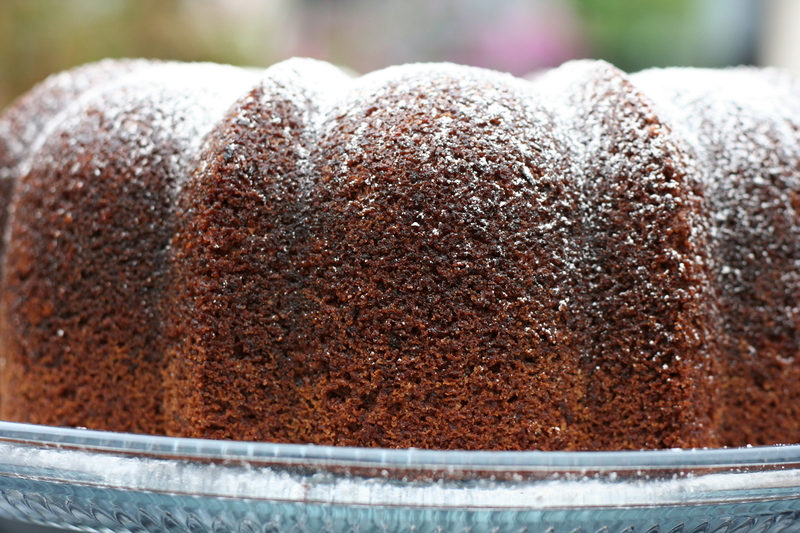 Remember the Persimmon Bundt Cake that I made a few weeks ago? Remember how cinnamony-spicy-delicious I described it to be? And, do you remember how I suggested that it would be a perfect cake for Christmas? Well, every year I celebrate Christmas Eve at a dear family friend’s home and we have a huge decadent dinner and sit around the Christmas tree and usually we open Poppers, decorate gingerbread houses, and this year we lit candles and had a lovely Winter Solstice moment. I was asked to bring a festive dessert, and the first thing I thought of was revisiting this Persimmon Cake. Wilbur, who does the bulk of the cooking for the holiday, is an amazing chef. I knew I couldn’t compete with his savory dishes, and even his desserts are out of this world. 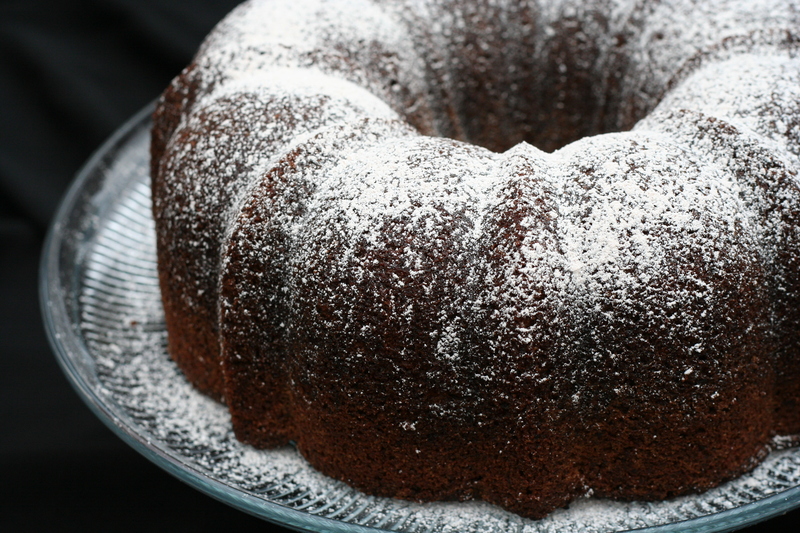 I wanted my cake to be a little more complex than the bundt cake sprinkled with powdered sugar (although that simple cake was incredibly tasty as it was! 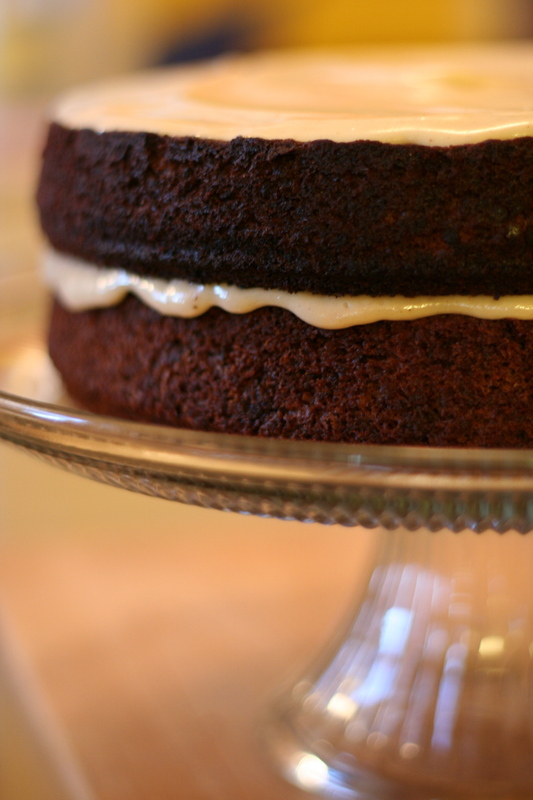 ), so I came up with a Nutmeg Frosting that complimented the combination of spices already in the cake. One of my favorite people to bake with is my friend Julie, because first of all, she is a great baker! 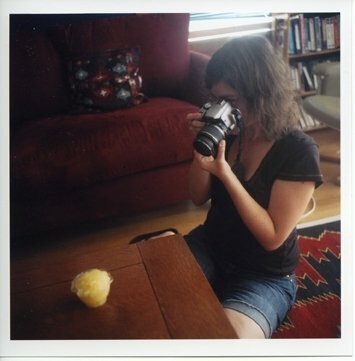 And to top it off, she is creative, open to taking pictures at each step of the way, and generally super. Together we have brainstormed, drawn out plans for, and baked some amazing desserts, including White Chocolate Champagne Cupcakes, White Russian and Strawberry Daiquiri Cupcakes, Piña Colada Cupcakes, Strawberry Lemonade Cupcakes, Lemon-Apricot Scones, and Bran Muffins. Did anyone else just notice a theme? If you were paying attention, you may have figured out that the two of us really like cupcakes! However, on Christmas Eve Day I needed a little help baking (and some good company!) and Julie came over like the good friend she is – even though I wasn’t making cupcakes! Because they are so sweet, we made an extra cake for her housemates to share. We simply doubled the original recipe, and then divided the batter between four pans (two 8-inch pans for Julie, and two 9-inch pans for me). Then, we baked the cakes for about 45 minutes (after the first 30 minutes, I checked the cakes with a toothpick inserted into the center every 5 minutes to see if they were done). After they cooled, we dolloped the center with huge spoons of frosting, and spread it out generously. We layered the cakes on top of each other, and slathered the tops with more frosting. Mmm. This cake is pretty sweet on it’s own, so it didn’t need frosting on the sides – This also allowed us to see the intense red color of the cake before slicing into it. 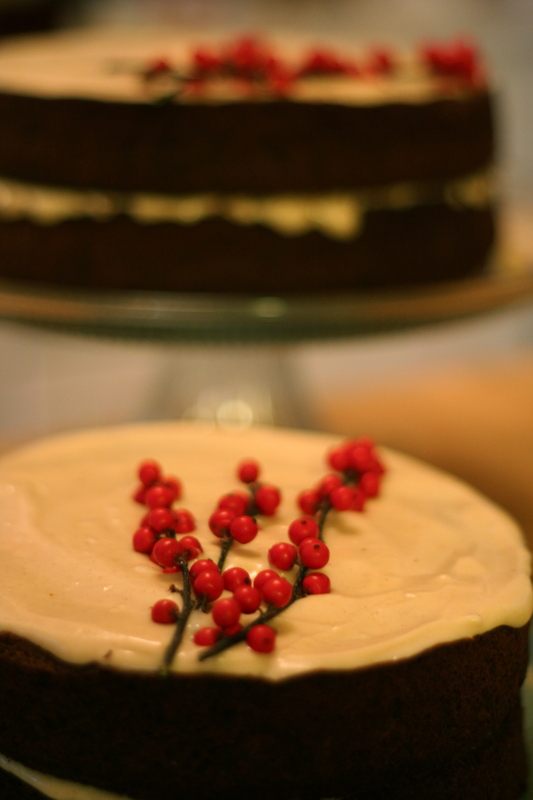 I made the cakes a little more festive by adding some red holly berries on top (not edible, but beautiful). To make the frosting, cream together the margarine and cream cheese until just combined. Add the powdered sugar half a cup at a time, mixing in each addition until smooth and creamy. Add vanilla extract and spices, and whip until fluffy and smooth. You can add more powdered sugar to reach your desired consistency, or add spices to change the flavor. Spread onto you fully cooled cake. Enjoy! Looking for a last-minute Christmas cookie? These Ginger Crinkle Cookies are for you! 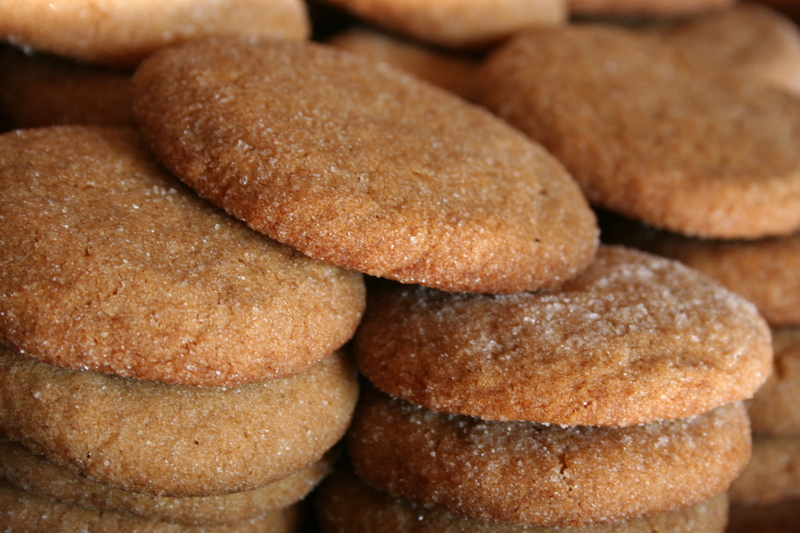 They are fast and easy to make, and fill your house with the scents of the season as they bake. Time your baking right so that you take them out of the oven just before your guests arrive, and you won’t need to do anything else to get them in the holiday spirit. I’ve made these cookies three times in the last couple weeks, because they are so tasty and have been gobbled up in no time flat! Thanks to the applesauce in the batter, these cookies are soft and chewy in the center, with crisp crunchy edges – perfect for all cookie lovers. 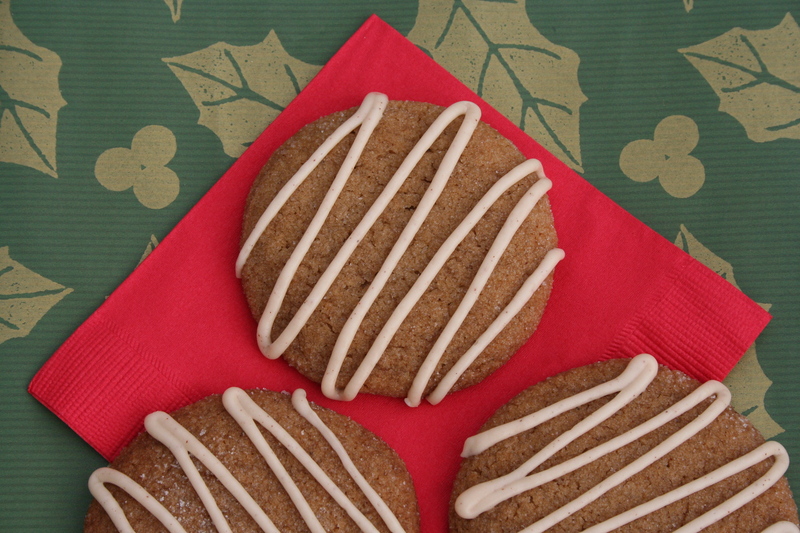 The fresh ginger gives them a nice spicy kick, and sets these cookies apart from more traditional gingerbread. Drizzled with a sweetly spiced Lemon Icing, they carry quite a citrus zing! In a large mixing bowl, beat Earth Balance with an electric mixer on medium to high speed for 30 seconds. Add granulated sugar, baking powder, baking soda, fresh ginger, cinnamon, cloves, and ground ginger. Beat until combined, scraping sides of bowl occasionally. Beat in applesauce and molasses. Beat in as much of the flour as you can with the mixer. Using a wooden spoon, stir in any remaining flour. Shape dough into 1-inch balls. Put the extra 1/2 cup of sugar in a small bowl, and roll your dough balls in the sugar to coat. Place balls 2 inches apart on an ungreased cookie sheet. Bake for 8-10 minutes or until edges are set and tops are crackled. Cool on cookie sheet for 1 minute, then transfer cookies to a wire rack and let cool completely. Makes 48 cookies. 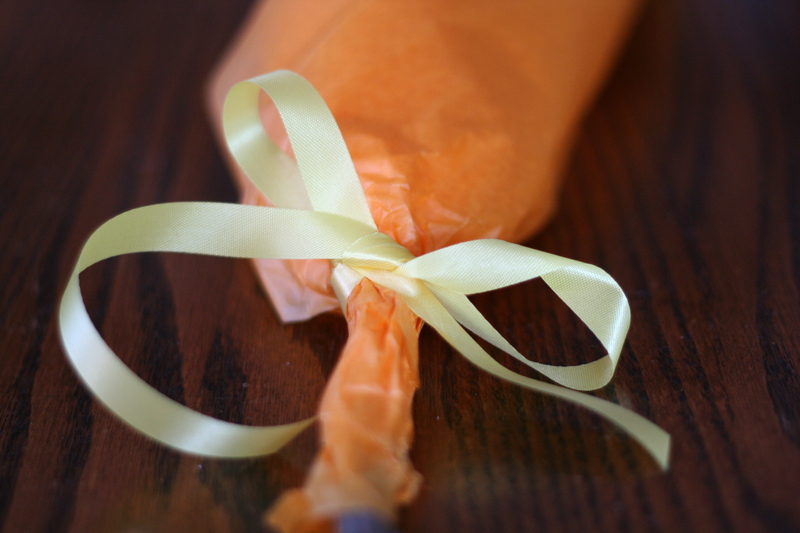 When cookies are cool, fill a pastry bag fitted with a very small round tip with Lemon Icing. 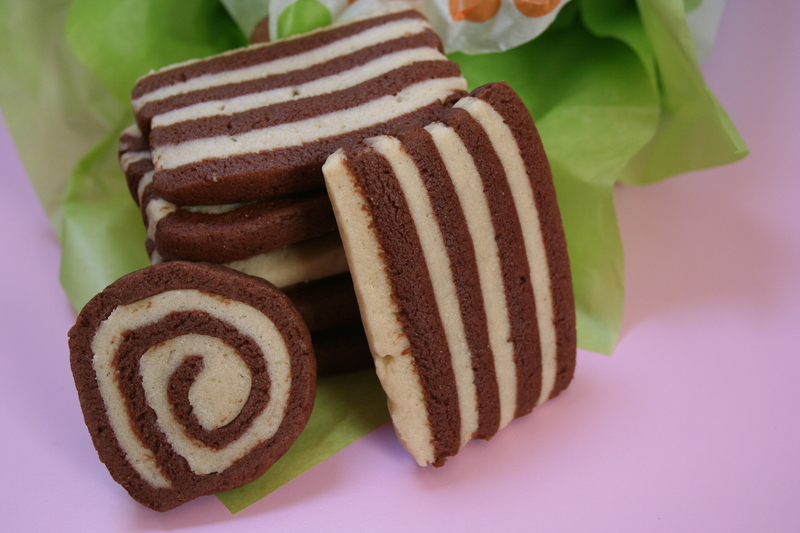 Pipe icing onto cookies in a zig zag pattern. Or, thin icing with additional lemon juice to make icing of drizzling consistency; use fork tines to drizzle icing over cookies. In a small mixing bowl, stir together the powdered sugar, cinnamon, and 1 tablespoon of the lemon juice. Add more lemon juice as necessary to make icing of piping consistency. Cookies and Candids is not going anywhere – we’re still here (clearly, because you made it to the blog!) and certainly still baking and photographing and, of course, still eating! But, to celebrate over a year of blogging, and because I got a push-in-the-right direction from a friend*, I’ve created a new domain name and a new, simpler, easier-to-remember web address! So, you can update your bookmarks, blogrolls, rss feeds, links pages, etc. to: http://thatsonetoughcookie.com. Don’t worry though! The original address at wordpress will still work, and will redirect you to the new domain, if that is easier for you – so either way, you’ll still get here. Thanks for your continued reading and vegan baking! *Thanks, Corey! What a lovely surprise Hanukah gift! What’s Black & White & Striped All Over? I’m done with my finals! And all of my student teaching. It was incredibly sad yesterday to say goodbye to all my five-year old students. I was choking back tears all day as they made me the most lovely and thoughtful gifts, and gave me hugs and asked why I have to leave them – Next semester I’ll be student teaching in a third grade class at a different school, which they don’t understand. One child said to me “But we have third grade here!” and another sweet girl told me with a completely straight face that I must be so smart because they’re sending me to third grade straight after Kindergarten. That was pretty classic and sort of made my heart melt. I was sad to leave my students, but I’m excited about having a little time off right now! I’m going to spend it mostly outside, taking hikes and bike rides, going to yoga, sleeping, having fun with friends, and of course baking. And, of course, updating my blog! Now I will have time to post recipes for all the cookies I’ve been baking! These cookies take some preparation time, so be aware of what you’re getting into when you begin! It’s not much labor but a lot of freezing/hardening time in between each step. They are worth the effort though, because they look very fancy, and are incredibly tasty. I’ve seen variations of them in many holiday cookie books. In fact, my mother likes to make a checkerboard version that is ultimately exactly the same, just a different way to roll and slice the cookies. 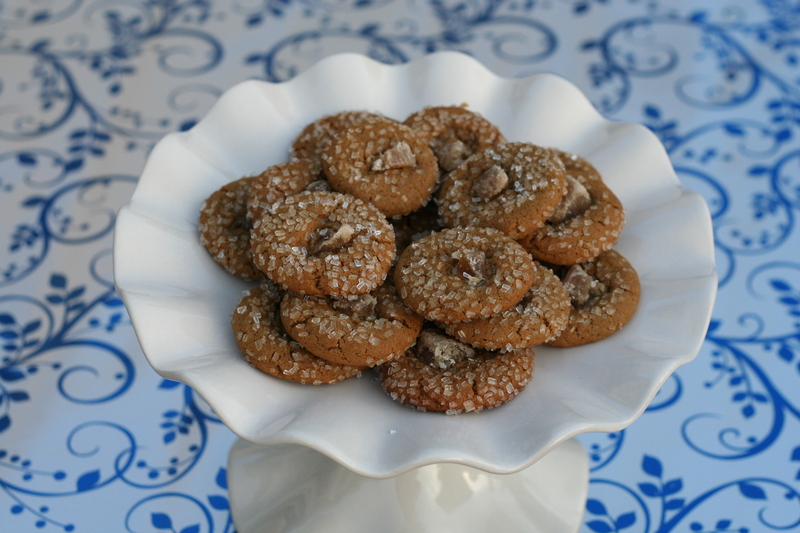 The Almond Dough is easy to adapt to your favorite flavor; you can take out the almond extract and add extra vanilla instead to have a very traditional cookie. One of my mother’s popular choices was to add orange rind into the dough to make a chocolate-orange combo, and I’m sure adding mint extract would be delightful. No matter what flavors you use, or shapes you create, these are perfect gift-giving cookies, since they are easy to stack and wrap, and they keep pretty well when in a covered container or wrapped tightly in plastic. To prepare the Almond Dough, lightly spoon 1 1/4 cups flour into dry measuring cups; level with a knife. Place 1/2 cup sugar, 1/4 cup Earth Balance, and blended Egg Replacer in a medium bowl; beat with a mixer at medium speed until smooth. Beat in vanilla and almond extracts. Gradually add flour to butter mixture, beating at low speed just until combined. Sprinkle 2 tablespoons ice water over surface of dough; beat just until moist. (Dough will be slightly crumbly.) Press dough into a 4-inch circle on plastic wrap; cover and chill 1 hour or until firm. To prepare the Chocolate Dough, lightly spoon 1 cup flour into dry measuring cups; level with a knife. Combine 3/4 cup flour and cocoa, stirring well with a whisk. Place 1 cup sugar, 1/4 cup Earth Balance, and Egg Replacer in a medium bowl; beat with a mixer at medium speed until smooth. Beat in 1/2 teaspoon vanilla. Gradually add cocoa mixture to butter mixture, beating at low speed just until combined. Sprinkle 2 tablespoons ice water over surface of dough; beat just until moist. Press dough into a 4-inch circle on plastic wrap; cover and chill 1 hour or until firm. Prepare a piece of parchment paper over your rolling surface. Unwrap and place chilled Almond Dough on the paper. Cover dough with and additional sheet of parchment paper. Roll dough, still covered, into a 12 x 8-inch rectangle. Place dough in freezer 5 minutes or until plastic wrap can easily be removed. Remove top sheets of parchment paper. Prepare another piece of parchment paper over your rolling surface. Unwrap and place chilled Chocolate Dough on the paper. Cover dough with an additional sheet of parchment. Roll dough, still covered, into a 12 x 8-inch rectangle. Place dough in freezer 5 minutes or until paper can easily be removed. Remove top sheets of parchment paper. Place Almond Dough on top of Chocolate Dough, paper side up. Remove paper from Almond Dough; turn dough over onto a lightly floured surface. Remove plastic wrap from Chocolate Dough. (***To make Spirals, see directions below. If you want to make Stripes, continue reading here***). Cut dough stack in half crosswise to form 2 (8 x 6-inch) rectangles. Stack one rectangle on top of the other, alternating Almond and Chocolate Doughs; wrap in plastic wrap. Freeze 10 minutes or until firm and plastic wrap can easily be removed. Cut the dough crosswise into 6 (6 x 1 1/3-inch) strips. 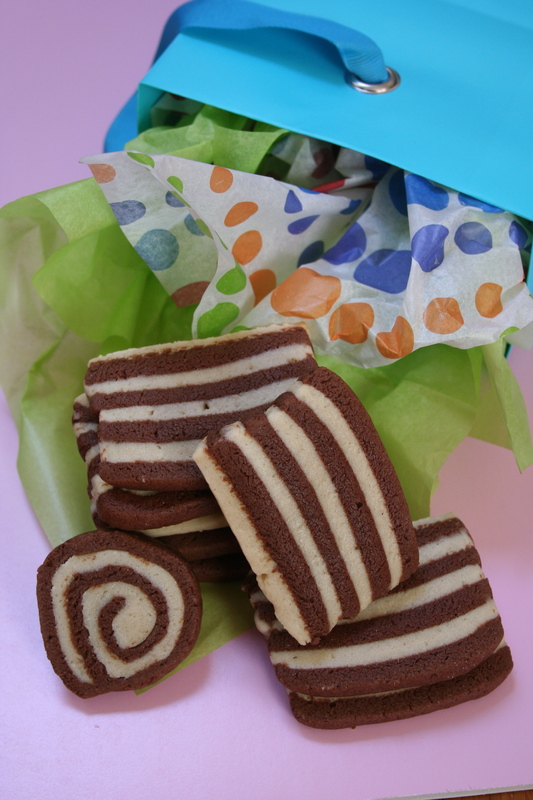 Stack 2 strips on top of each other to form a stack, alternating Almond and Chocolate to form a striped pattern; wrap in plastic wrap, pressing gently. Repeat procedure with remaining 4 strips to form 2 stacks (there will be 3 stacks total). Chill 30 minutes or until very firm. Working with 1 stack at a time, unwrap dough. Carefully slice each stack into 12 slices. Place dough slices 2 inches apart on baking sheets lined with parchment paper. Bake at 375° for 12 minutes. Cool on pans for 5 minutes. Remove cookies from pans; cool completely on wire racks. Roll your double-layer of dough in a tight spiral shape, starting from the long (12-inch) side. When you have rolled your dough, press down lightly on the edge so that it sticks. Cut your log in half, and wrap each piece in plastic wrap. Chill in the freezer for 20 minutes or until very firm. Preheat oven to 375° and line baking sheets with parchment paper. Slice your logs in 1/4-inch slices, and place each slice 2 inches apart on prepared pans. Bake at 375° for 10 minutes. Cool on pans for 5 minutes. Remove cookies from pans; cool completely on wire racks. This chocolate fudge recipe originally came to me via my friend Jake’s mother, who made it in the form of refrigerator drop cookies, and they totally blew my mind as the most decadent, easy, and fast kind of cookie I’d ever encountered. Since she gave me the recipe, I’ve made them many many times, with a slew of different ingredients depending on the occasion, season, or friend I wanted to share it with. For this holiday season, I knew I wanted to have these chocolate morsels in my cookie gift boxes, but I didn’t want them to take the same form as usual. I decided to mix it up a little, and make it into fudge! Really, the recipe is exactly the same, but I poured the batter into a brownie pan and after it hardened I cut it into small squares. This way, it looks different from the other cookies I’ve been making, but tastes exactly the same as if it had been a fudgey drop cookie. Mmm. The recipe is flexible – add whatever extra flavors or textures that you want. I can imagine it tasting delicious without the peanut butter and instead adding crushed candy canes and peppermint extract for the holiday season! Alternatively, add coffee (or espresso powder) into the hot melted chocolate and give your treats an extra energy kick. 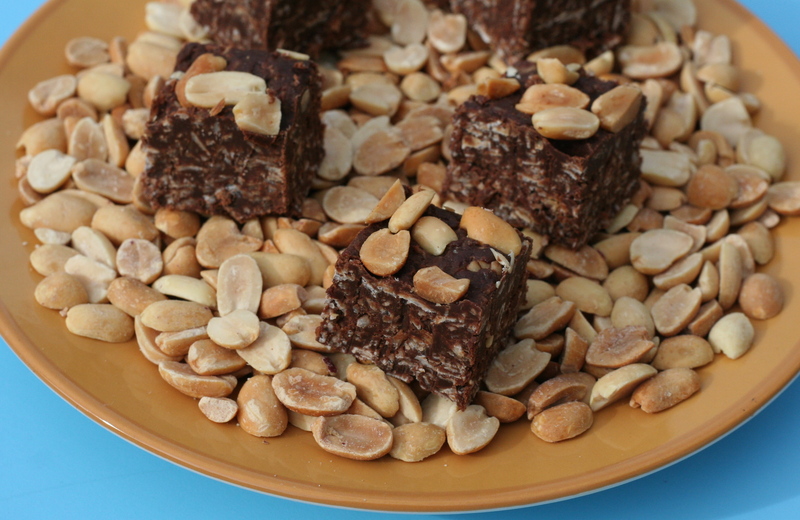 You could even add coconut extract to the recipe, and pat extra dried coconut onto the top of the fudge for a decorative snow-like treat. 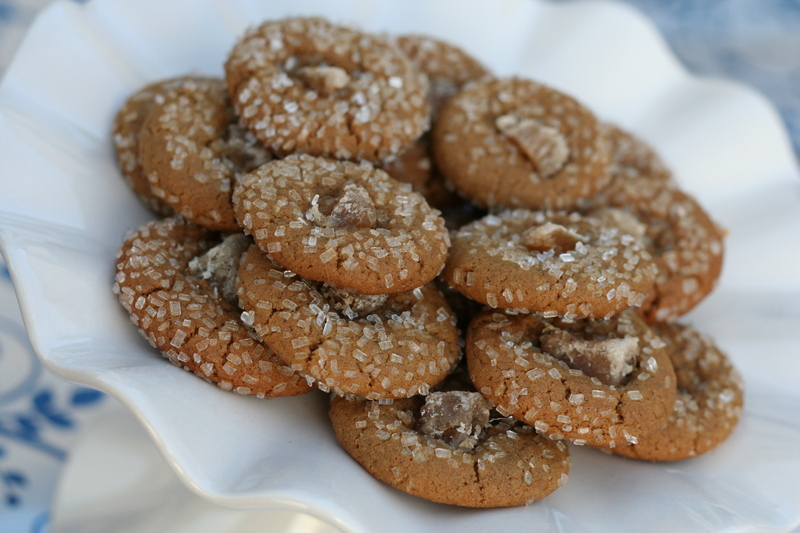 If you want to make these into drop cookies, cover a baking sheet with parchment paper. If you want to make fudge, line a brownie pan with parchment paper. Combine the Earth Balance, cream, and sugar in a two-quart saucepan. Warm over medium heat until sugar dissolves. Remove from heat, and add vanilla and chocolate chips. Stir until the chocolate melts completely. Fold in the oats (and if you are using them, add the peanut butter and coconut at this point too), and stir until thoroughly combined. For cookies: Drop the batter in even, large spoonfuls onto your prepared cookie sheet and refrigerate until hardened. After they are hard, you can leave the cookies in a covered container at room temperature. For fudge: Spread batter into your prepared brownie pan, and smooth out the top. Sprinkle extra coconut, peanuts, crushed candy canes, or whatever topping you’d like to use on the top and press it down slightly so it sticks to the fudge. Let the fudge harden in the fridge, then take it out and slice into small cubes. Like the cookies, these can be left at room temperature in a closed container until you want to eat them. *If you want your cookies/fudge to be gluten-free, make sure you check to see if your oats are processed in the same facility as wheat or are guaranteed to be gluten-free. Alternatively, you can use quinoa flakes as a good gluten-free, and protein-packed substitute. The Fuyu persimmons are a non-astringent variety of persimmon (it won’t dry out your mouth, I promise). They are flat, and not pointy like the other type. You want to eat them while they are still firm and crunchy like an apple, and you can eat them peeled or unpeeled. They are very sweet. I love them! It was a good thing we had so many of them growing on our tree outside, although when I made this cake I doubled the recipe and used up every single persimmon we had left! I’m already looking forward to next year’s persimmon tree harvest so much! Previously I posted a recipe to make Dried Persimmons and for Persimmon Granola, and typically the only recipes I’ve found elsewhere for using Fuyus in are for salads, salsas and chutneys. A few years ago, I blended some of the Fuyus up and put them in cookies, and they tasted sweet and very autumn-like, especially because of their beautiful orange color. So, I thought, why not put them into cake? My mom found this recipe online, and it’s originally from an old Sunset Magazine. I’ve adapted it a bit, to make it vegan and a little spicier. 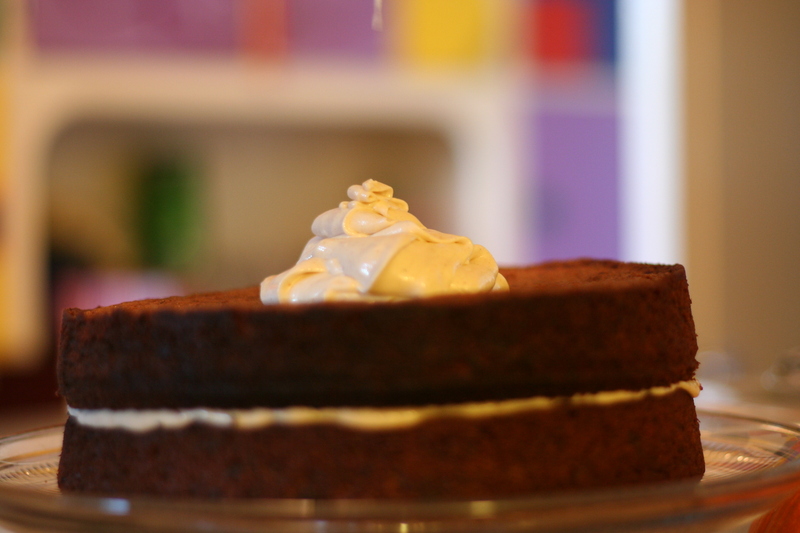 This cake has a near-gingerbread taste, although it has no ginger in it to speak of…Although, it does have a lot of other spices! The cinnamon, cloves, nutmeg, and cardamom really give this cake a wonderfully spicy holiday touch, which was perfect because I brought it to a Christmas party this past Saturday. (Can I just say, I had two Christmas parties to attend on Saturday, and I heard about a few others that were being held at the same time – Hello people, it was only December 12th, two weeks before Christmas! And it was the second night of Hanukah! Goodness, Christio-normative world!). But I say all this with a grin and an eye-roll directed purely at myself, because I actually really do enjoy Christmas celebrations, especially ones like the cozy, warm, beautiful, and delicious party thrown this weekend by one of my colleagues. And I have many more to look forward to in the coming weeks, which makes me wish I had more persimmons to bake with! Blend your persimmons till smooth. Add baking soda and blend till well combined, and then set aside while you mix the other ingredients together. In a large bowl, beat the Earth Balance with the sugar. Add your egg replacer, lemon juice, and vanilla and beat until fluffy. Stir in the fuyu mix (it should be much firmer than before, more like a jello-consistency). Sift together flour, baking powder, ground cloves, cinnamon, nutmeg, and cardamom. Fold the dry mix into the wet. Pour (or spoon, because the batter is thick) into prepared bundt pan. Bake for 55-60 minutes, or until a toothpick inserted into the cake tests clean. Wait until the cake is cooled to invert and take it out of the pan. Dust with powdered sugar or drizzle with an orange glaze.